One vital element to landing gigs as an actor is knowing the difference between an audition and an interview or meeting. 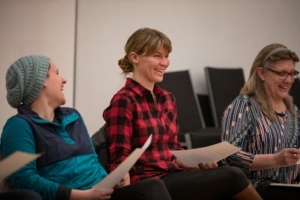 Whether you’re meeting in a formal setting or are networking on the fly, this pitch intensive is a hands-on exploration of business pitching techniques in the realm of the arts. Get the tools to help you succeed when you land a meeting with an agent, casting director or producer of a film. Don’t miss the chance to work with an actor and theatre teacher who has been bridging the world of business and arts for more than 20 years. 8 student minimum, 14 maximum.